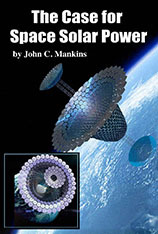 Landmark book: The Case for Space Solar Power by John C. Mankins. A must read! This groundbreaking book by renowned expert John Mankins lays out a path forward that is both doable and affordable: within a dozen years or less, the first multi-megawatt pilot plant could be in operation. Space Solar Power could transform our future in space, and could provide a new source of virtually limitless and sustainable energy to markets across the world. See NSS review. Available as a Kindle e-book for $9.95 (with free Kindle apps for any device). The United States and the world need to find new sources of clean energy. 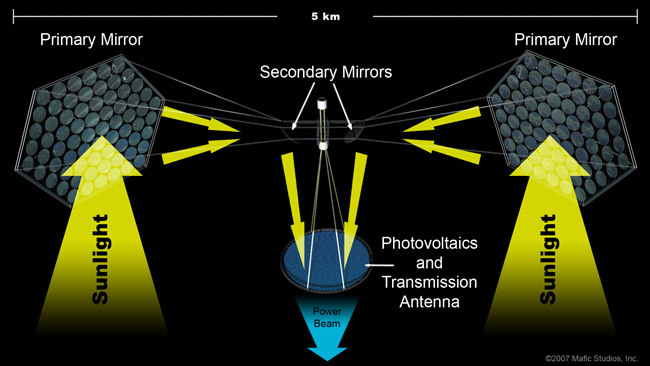 Space Solar Power gathers energy from sunlight in space and transmits it wirelessly to Earth. Space solar power can solve our energy and greenhouse gas emissions problems. Not just help, not just take a step in the right direction, but solve. Space solar power can provide large quantities of energy to each and every person on Earth with very little environmental impact. The solar energy available in space is literally billions of times greater than we use today. The lifetime of the sun is an estimated 4-5 billion years, making space solar power a truly long-term energy solution. As Earth receives only one part in 2.3 billion of the Sun’s output, space solar power is by far the largest potential energy source available, dwarfing all others combined. Solar energy is routinely used on nearly all spacecraft today. This technology on a larger scale, combined with already demonstrated wireless power transmission (see 2-minute video of demo), can supply nearly all the electrical needs of our planet. Another need is to move away from fossil fuels for our transportation system. While electricity powers few vehicles today, hybrids will soon evolve into plug-in hybrids which can use electric energy from the grid. As batteries, super-capacitors, and fuel cells improve, the gasoline engine will gradually play a smaller and smaller role in transportation – but only if we can generate the enormous quantities of electrical energy we need. It doesn’t help to remove fossil fuels from vehicles if you just turn around and use fossil fuels again to generate the electricity to power those vehicles. Space solar power can provide the needed clean power for any future electric transportation system. While all viable energy options should be pursued with vigor, space solar power has a number of substantial advantages over other energy sources. Unlike oil, gas, ethanol, and coal plants, space solar power does not emit greenhouse gases. Unlike coal and nuclear plants, space solar power does not compete for or depend upon increasingly scarce fresh water resources. Unlike bio-ethanol or bio-diesel, space solar power does not compete for increasingly valuable farm land or depend on natural-gas-derived fertilizer. Food can continue to be a major export instead of a fuel provider. Unlike nuclear power plants, space solar power will not produce hazardous waste, which needs to be stored and guarded for hundreds of years. Unlike terrestrial solar and wind power plants, space solar power is available 24 hours a day, 7 days a week, in huge quantities. It works regardless of cloud cover, daylight, or wind speed. Unlike nuclear power plants, space solar power does not provide easy targets for terrorists. Unlike coal and nuclear fuels, space solar power does not require environmentally problematic mining operations. Space solar power will provide true energy independence for the nations that develop it, eliminating a major source of national competition for limited Earth-based energy resources. Space solar power will not require dependence on unstable or hostile foreign oil providers to meet energy needs, enabling us to expend resources in other ways. Space solar power can be exported to virtually any place in the world, and its energy can be converted for local needs – such as manufacture of methanol for use in places like rural India where there are no electric power grids. Space solar power can also be used for desalination of sea water. Space solar power can take advantage of our current and historic investment in aerospace expertise to expand employment opportunities in solving the difficult problems of energy security and climate change. Space solar power can provide a market large enough to develop the low-cost space transportation system that is required for its deployment. This, in turn, will also bring the resources of the solar system within economic reach. High development cost. Yes, space solar power development costs will be very large, although much smaller than American military presence in the Persian Gulf or the costs of global warming, climate change, or carbon sequestration. 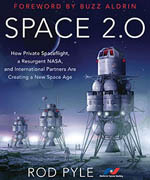 The cost of space solar power development always needs to be compared to the cost of not developing space solar power. Low-cost, environmentally-friendly launch vehicles. Current launch vehicles are too expensive, and at high launch rates may pose atmospheric pollution problems of their own. Cheaper, cleaner launch vehicles are needed. Large scale in-orbit construction and operations. To gather massive quantities of energy, solar power satellites must be large, far larger than the International Space Station (ISS), the largest spacecraft built to date. Fortunately, solar power satellites will be simpler than the ISS as they will consist of many identical parts. Power transmission. A relatively small effort is also necessary to assess how to best transmit power from satellites to the Earth’s surface with minimal environmental impact. All of these technologies are reasonably near-term and have multiple attractive approaches. However, a great deal of work is needed to bring them to practical fruition. In the longer term, with sufficient investments in space infrastructure, space solar power can be built from materials from space. The full environmental benefits of space solar power derive from doing most of the work outside of Earth’s biosphere. With materials extraction from the Moon or near-Earth asteroids, and space-based manufacture of components, space solar power would have essentially zero terrestrial environmental impact. Only the energy receivers need be built on Earth. Space solar power can completely solve our energy problems long term. The sooner we start and the harder we work, the shorter “long term” will be. 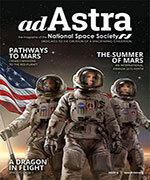 New Developments in Space Solar Power. John C. Mankins. NSS Space Settlement Journal. December 2017.